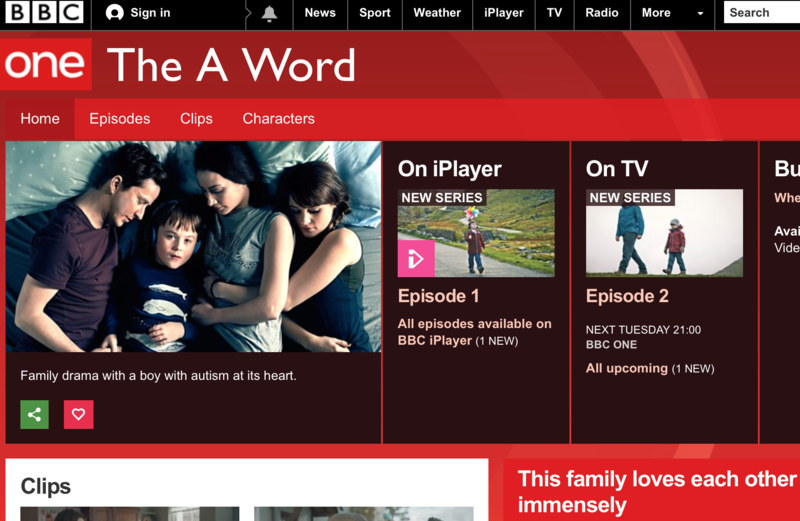 We sought views on new BBC autism drama 'The A Word'; from Graham Findlay, whose son has ASD, and Jonathan Andrews, an autistic self-advocate. Set in the idyllic scenery of the Lake District, with a hint of brooding darkness to come, The A Word is a character-driven drama about an ordinary, loving, mildly dysfunctional, gobby extended family. Except something slightly out of the ordinary is happening with Joe (Max Vento), the 5-year-old son of Alison and Paul (Morven Christie and Lee Ingleby) and grandson of Maurice (played brilliantly bluntly by Christopher Eccleston – ‘my grandson needs fixing, who do I turn to?’). The A Word is Autism. Joe likes to listen for hours on end to punk, 80’s and indie music, inherited from Dad, on his headphones. He won’t play with other kids. He won’t talk much, and repeats his pet phrases. He’s got a huge vocabulary. Alison and Paul tell everyone he’s a genius. Other members of the family, especially Grandad Maurice, know there’s an elephant in the room, and eventually the rather over-direct clinical psychologist (Mina Anwar) confirms that Joe is on the autistic spectrum. His parents are stunned and disbelieving, although the suggestion is that deep down they have known this for some time. So ends Episode 1 of 6. The A Word is written by Peter Bowker, who was also responsible for the TV play Marvellous about Neil Baldwin, the Stoke City fanatic who happens to have a learning disability. Bowker was an SEN teacher before becoming a professional writer, and it shows in spades. Both Marvellous and The A Word manage to pull off the difficult trick of not making its subject mawkish and sentimental, a trap many other fictions about autism fall in to. Bowker deftly humanises and demedicalises disability. Joe is both central and peripheral to the complicated family dynamics – he is one other thing to deal with, not a central tragedy that devastates everyone around him. No soppy oboe and violin soundtracks here – this is at heart a drama about a family, with all its exasperations, sibling rivalries, adult parental/child conflicts, work pressures and emotional schisms. But with a twist. As a dad with a son (now a man of 23) with ASD, a lot of the scenes resonated with me. Secretly knowing something is not quite right with your child, denial, proclaiming your son a genius, the assessment and diagnosis – all of it rang true, as did the complicated family dynamics. I’m looking forward to episode 2. - Graham Findlay is a disability equality consultant and parent of three disabled children. The BBC’s ongoing series ‘The A Word’ depicts the issues faced by a family when their 5-year-old child, Joe, is diagnosed as autistic. I watched the first episode when it was aired on 22 March, and afterwards noticed a huge range of responses from other commentators. Many without any first-hand knowledge of autism loved it for helping them understand more; others, generally those with autism themselves, tended to criticise the show as presenting autism as too much of a tragedy – especially through the behaviour of Joe’s parents – and not representing their own experiences of autism. However, as an autistic self-advocate I felt that, while the depiction of Joe could at times appear stereotyped, it would have been impossible for any show to accurately reflect the experiences of every autistic person or parent – everyone on the spectrum is different, as is every family. And I thought one great element was the eccentric nature of almost every member of Joe’s family – so he didn’t seem too out-of-place. It would have been very easy to depict Joe as the 'odd one out' by surrounding him with a ‘perfect family’ – kind, considerate, empathetic and attentive, everything an autistic person supposedly shouldn’t be – but instead, his other-ness is expressed through the display of real, obviously well-researched autistic traits, while the family, though “normal” by comparison, are wonderfully dysfunctional. It was interesting to spot the traits many would associate with autism within them. Joe’s grandfather’s (Christopher Eccleston) apparent tunnel-vision insistence on solving the problems he sees – including Joe’s behaviour – means he pursues this without any consideration for the complex web of familial rules, effectively going behind his daughter’s back and unilaterally acting as Joe’s father to bring him to a doctor. He does so with the best of intentions, yet his manner means he often causes great friction and tension not because of what he is doing, but how he is doing it – something which could also apply to the abrasive personalities of the rest of the family. Take, for example, Vinette Robinson’s Nicola, whose instincts within seconds of witnessing Joe’s behaviour at his fifth birthday party are that he may have a communication disorder – very little of what she says is wrong, if any, and her advice ultimately leads to the family better understanding Joe, yet she speaks and behaves in such a way, a confidence bordering on arrogance, that others find it difficult to listen. Meanwhile, Joe’s parents obsess over things that affect their own pride more than his happiness – the fact he doesn’t want to play ‘Little Statues’, that children aren’t inviting him to their birthday parties, or his reluctance to play football, none of which he appears remotely bothered with, being quite happy to explore independently and listen to, and recite, his favourite music. I couldn’t help but wonder if this recurring theme of misplaced compassion expressed tactlessly was the writer’s subtle allusion to the modern belief that autistic people struggle with cognitive empathy – understanding others – but not emotional empathy – caring instinctively for others – and so often act with the best of intentions in ways which upset or confuse others. This was certainly my reading of the family’s behaviours – too much empathy for him, and no idea how to use it. Yet the family also seemed to view anyone who wasn’t autistic – every character other than Joe – with a sort of distain and tiredness, many of their conversations descending into bitter attacks on each other, and expending a lot of energy on pointless and hurtful arguments. Joe took no part in these, of course, spending more time content and happy than anyone else – an example of where his autistic “isolation”, or “being in his own little world”, was something of a strength. It was also interesting to see a nod to issues currently discussed among self-advocates, such as the “language politics” surrounding autism – with Dr Waite’s insistence that she would never describe someone as “autistic”, but only as “on the autism spectrum” or “has autism”; the view of the majority of clinicians working in the area, though not necessarily the majority of autistic self-advocates. Personally I can find such battles trivial at times, but the show was very good at showing that at times, language does matter. Joe’s parents were horrified that he might be “autistic”, yet showed relative acceptance he might “have autism”. It was also clear a lot of research of the clinical and diagnostic side of autism had been carried out, though there were still glaringly unrealistic elements – the speed of diagnosis did seem unfeasibly fast, especially given many parents and children have to wait years and go through many more stages than that shown, for example, although I’d imagine concerns over the pacing of the series paid a large part here – if the main selling point is autism awareness, it wouldn’t make sense to have the diagnosis made at the end of the series, as then there’d be no time to explore life afterwards. All in all, while not perfect, I felt the depiction of autism in ‘The A Word’ was sensitive, thought-provoking, and accessible to those without prior knowledge of autism – and I’ll certainly be tuning in again. - Watch now on BBC iPlayer. - Jonathan Andrews is a future trainee solicitor at Reed Smith and sits on the UK Parliament's Westminster Commission for Autism. He is chairman of Ambitious about Autism's Youth Council and vice-chair of Commonwealth Secretary-General Baroness Scotland’s Elimination of Domestic Violence Youth Council; he recently won the National Autistic Society Professionals Award for 'Outstanding achievement by an individual on the autism spectrum' and was shortlisted for the National Diversity Awards 2015. He's also a prizewinning poet. For more about being the parent of a child with autism, read 'My son's not Rainman' from our October 2014 special. New Voices: What is autism, anyway?